erformance during this vital stretch of the season. The Cat/Dog is an excellent warmup movement when faced with increased travel, hotels, and racing. The mainset exercise is the TRX Atomic Pushup, a great unloaded, full-body, plyometric exercise. Next, we move on to the Side V-Up, a core exercise aimed to help with turns and underwaters. The Lying Figure-4 stretch will wrap up today's workout, which is great for post-travel and post-competition recovery. I hope that you have enjoyed the first of the Collegiate Championship Series segments, and gained some tips and tools to add to your repertoire. 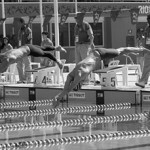 Stay tuned to BridgeAthletic.com and SwimSwam.com for more fantastic educational content.